Wikileaks is about to confirm the story that The Common Sense Show told 4 years ago in that Ambassador Stevens was set up to die because his stories of gun-running, child trafficking and drug-running on behalf of the CIA in order to promote regime change in Libya using terrorists funded by these illegal activities, were leaking out and it was only a few months until the election. Subsequently, Ambassador Stevens had to be silenced. And Petraeus had to be put in a place where he was not forced to testify before Congress because he could not take the 5th before Congress. 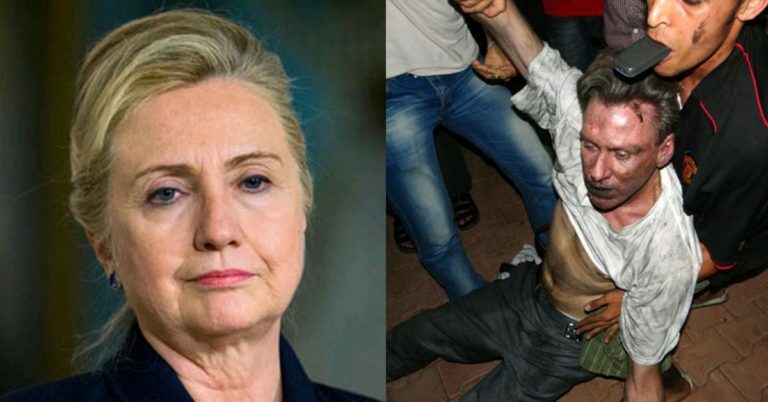 At the same time, Clinton was broadcasting Stevens whereabouts and she refused to provide the extra protection Stevens was so desperately requesting. Being that Stevens was working for the CIA, then head of the CIA, David Petraeus, would have known about Chris Stevens activities. To protect Obama’s 2012 election, both Stevens and Petraeus had to be gone. People are asking me how I knew all of this four years ago and I say, “I had a deep cover source from inside one of the military/intelligence services who wanted the real truth to be told. Somebody who knew this nation could not afford to let Clinton ever become President”. Now, I am getting confirmation from Wikileaks and others who have reached the same conclusion I did four years ago. Please note that I have covered the ISIS/Lafarge/Clinton connections very prominently in the past year. This is just more confirmation of what I have already covered. The above is already appearing on the Internet in several places. It is clear that Putin would be a fool to allow Clinton and her gang of thugs to continue with their plan. Every time Clinton sags in the polls, she starts talking about 9/11. The evidence is beginning to line up that Clinton interests had motive to commit 9/11. No wonder Clinton tries to blame the Russians for everything, she is the main culprit on the world being brought to the precipice of World War III. It is a gratifying feeling when the dots start to connect. Aaron Klein, the Breitbart Bureau Chief for Jerusalem revealed, in a Breitbart publication dated March 1, 2016, revealed that “the email from April 10th, 2011, the State Department employee, Timmy Davis, forwarded an email to the server by Clinton’s aide, Huma Abedin.” Please note that the time of this revelation, Huma Abedin, was not yet a household name. The series of emails will eventually have catastrophic consequences for Ambassador Stevens. Below are some examples of the allegations posed by Klein and these are not empty charges as Klein offered as proof, the following emails. “A March 27, 2011 email released last year was titled, “Chris Stevens mission.” It divulged: “The current game plan is for Mr. Stevens to move no later than Wednesday from Malta to Benghazi. He will stage offshore initially for a one day visit during which he will have meetings with TNC interlocutors and get a sense of the situation on the ground. The goal of this one day trip is for him to lay the groundwork for a stay of up to 30 days. If later emails are released, I have no doubt, that we will see that Clinton was transmitting Stevens location up until the time of the attack upon the Benghazi compound and this explains why some of these emails are not being released. However, at some point, they will see the light of day. The release of travel information, in any form, is a felony! Remember, the Stevens travel plans are classified and they came from Clinton’s private server. A casual Law and Order fan could make the causal connections between the release of these emails and Stevens death. This is absolute evidence that Clinton not only is guilty of multiple felonies, she is an accomplice to murder!